Ich habe letzte Woche (23.-24.07.) am hochinteressanten Workshop „Mapping Transnational Space“ an der York University in Toronto, Kanada, teilgenommen. Der Workshop thematisierte Kartierungen transnationaler Räume aus einer kritischen Perspektive. Regionale Schwerpunkte lagen auf den Grenzen Nordamerikas, der Europäischen Union sowie von Palästina/Israel. In der letztgenanten Session haben Jess Bier und ich jeweils einen Vortrag gehalten. Jess hat ein Kapitel aus ihrer Dissertation vorgestellt, in welchem sie die Einführung einer „professionellen“ nationalen palästinensischen Kartographie in der Phase nach den Oslo-Verträgen untersucht hat. 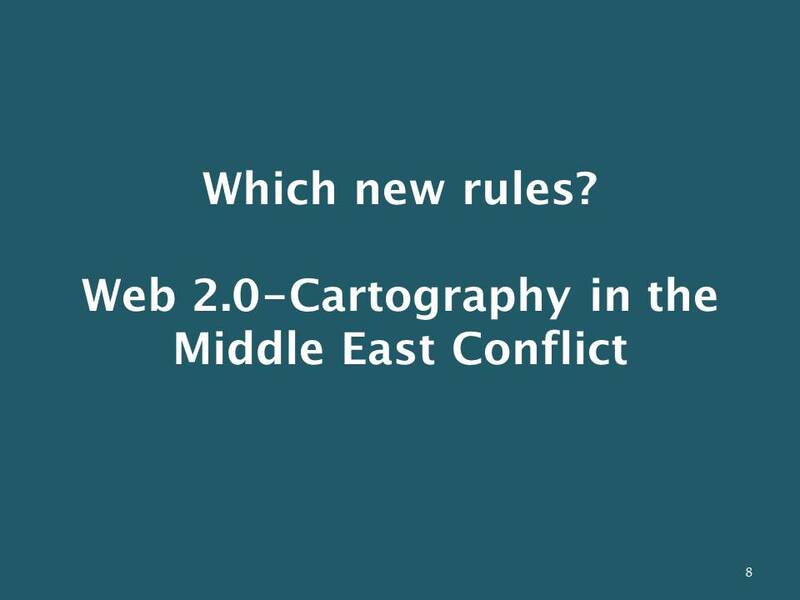 I‘m working on a PhD project titled „web 2.0 cartography in the middle east conflict“. What I present you here is a central line of argumentation for that project. However, so far I haven‘t done much empirical research to back the assumptions I‘ll make today. So all of this is still in a rather preliminary state and I‘ll of course be happy to hear critical comments and new ideas. What old game am I talking about? 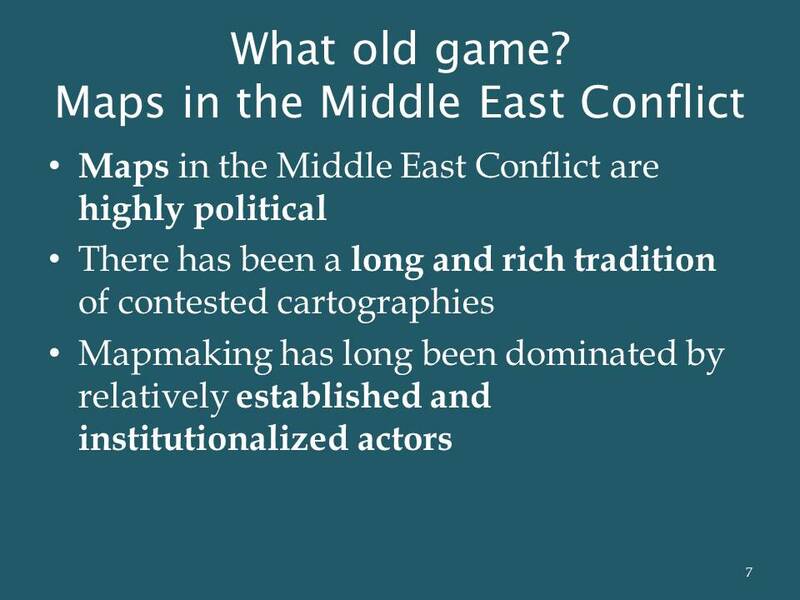 In the context of the Middle East Conflict, which is, at its core, a conflict about territory, maps have always been of highest political importance. The course of national borders, the selection and signature of certain places and even the language of textual map elements are political choices a cartographer makes during the creation of a map. Each of these elements contains codes, indicating whether a Palestinian or an Israeli landscape is represented on a map. The conflict has, unsurprisingly, a long and rich tradition of contested cartographies from various actors and perspectives. It started, I shall argue, with Zionist maps from the late 19th century onwards to help establishing a Jewish state. Drawing on a mythical semi-secular interpretation of the bible, early Zionists combined divine elements with a modern nationalist agenda. Thus, the land which god promised to his chosen people should serve as a territorial base for a modern secular Jewish state. To this end, a strong geographical imagination was constructed, portraying Palestine as an empty and uninhabited land waiting for its right masters to return home at last. 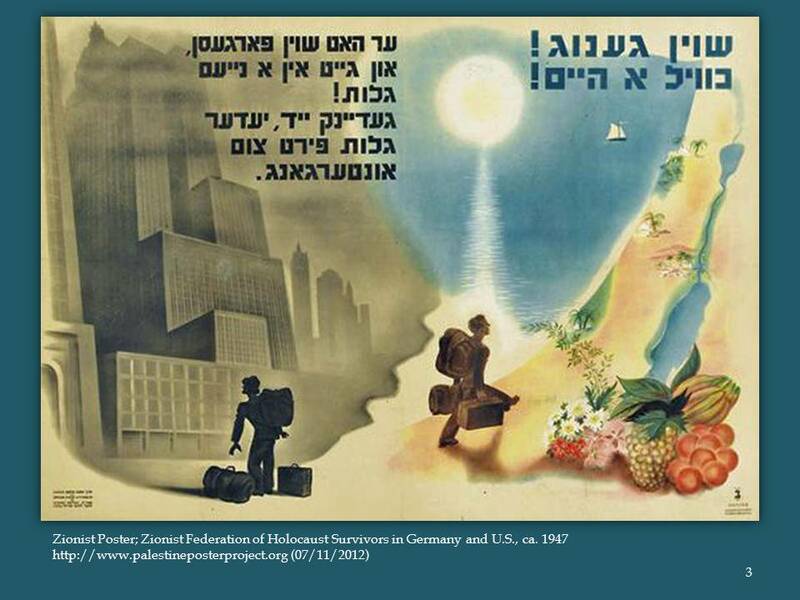 The portrayed image had been distilled in the famous Zionist phrase “A Land without a People for a People without a Land”. Until today, both Israeli and Palestinian maps follow this rhetoric of ignoring and silencing the other. 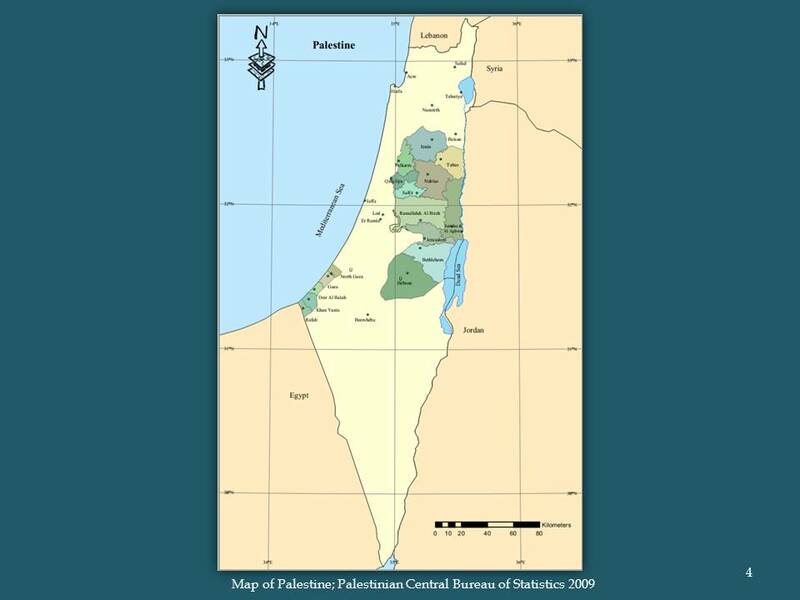 Be it in official Israeli maps that wiped away the green line, or maps of the Palestinian authority which do not name the state of Israel, nor any cities that have been founded there since Ottoman times. By using these examples I do not intend to reduce the conflict to a question of territorial authority. Nor do I want to oversimplify Israeli or Palestinian nationalist movements. Indeed both nationalisms are contested and challenged from within “their own society” as much as from “the other side”. What I want to emphasize here is how sensitive the issue of mapping is in this context, because every attempt to map one side has worked at least partially to violate the right of existence of the other. 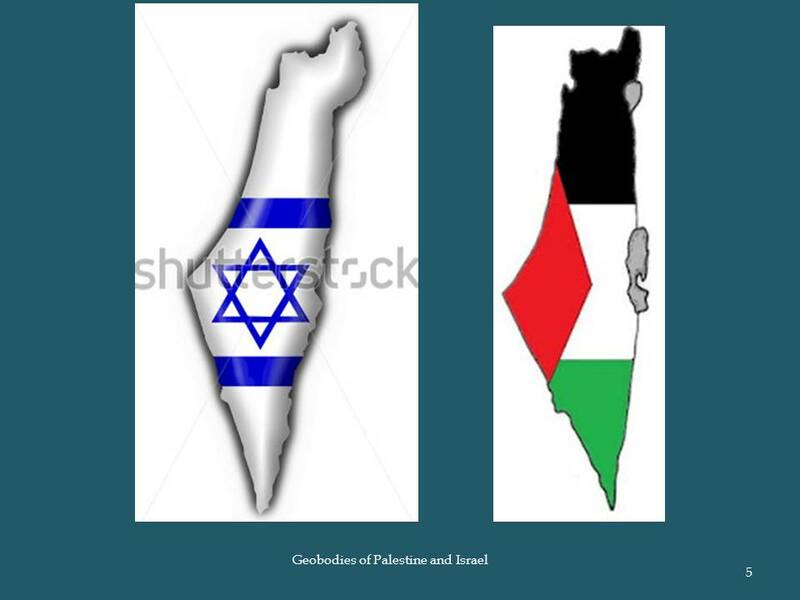 Both nationalisms are in their territorial dimension absolutely incompatible, as the iconic ‘geobodies’ of Israel and Palestine illustrate (next slide). Although mechanisms of exclusion can be found in every map in (or of) the world, the cartographic discourse in the context of Israel/Palestine is heavily challenged and contested – I think more than in most other places. 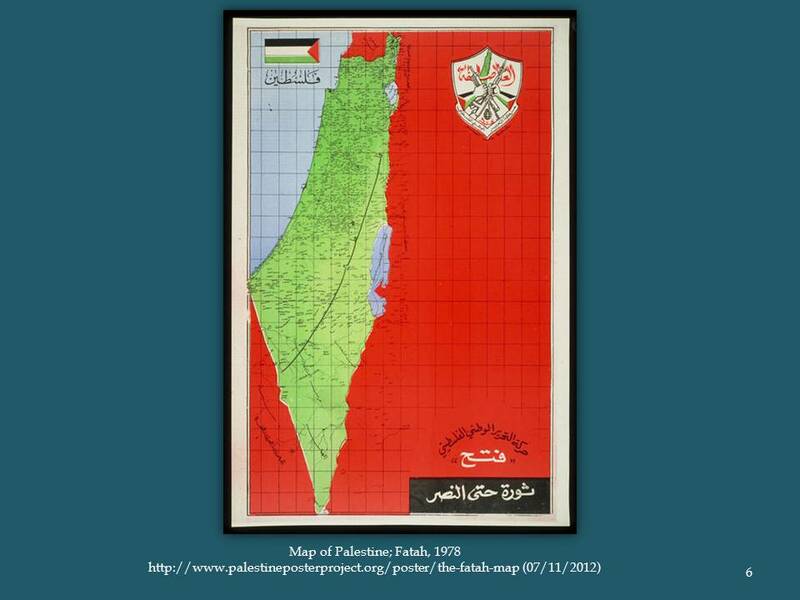 …when the organizations Fatah and PLFP created first counter-maps in the aftermath of the October War 1967. This poster was made by the Fatah in 1978, showing a map of whole Palestine in Arabic which ignores Israel or any Jewish presence completely. In what follows now I argue that this old game is recently being played by new rules, as cartography is being transformed in the internet. This affects foremost the constellations of involved actors in cartography. The term web 2.0 refers to developments of the internet since around 2000. Generally spoken, it describes a growing degree of interactivity due to new opportunities for users to create or modify contents of the web themselves, instead of just receiving, or consuming them. Think of examples like Wikipedia or Facebook, where all contents are user generated via crowdsourcing. Traditional distinctions between producers and consumers or professionals and amateurs often become fuzzy and contested in this environment. One prominent example for such a rearrangement of established structures is the realm of cartography. In recent years with the rise of online mapping platforms, mapping has been performed increasingly by non-professionals. 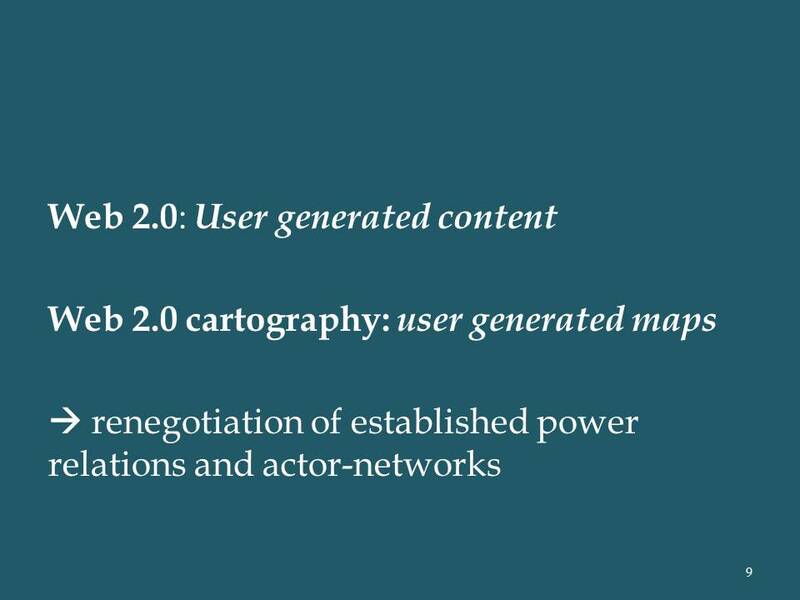 Web 2.0-mapping is thus leading to a renegotiation of power relations and actor-networks in the realm of applied cartography. 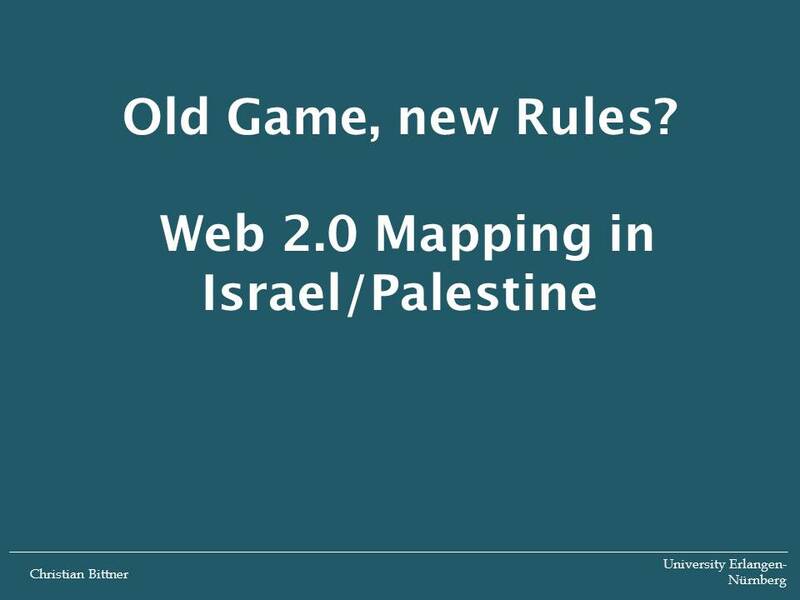 In the following, I’ll show different types of web 2.0-maps to give an overview both, of the technological spectrum of web 2.0-maps and the contents of the maps, showing new ways to map the region or the conflict itself. This silde shows a map from the website „Kan Garim“ (meaning “living here” in hebrew). 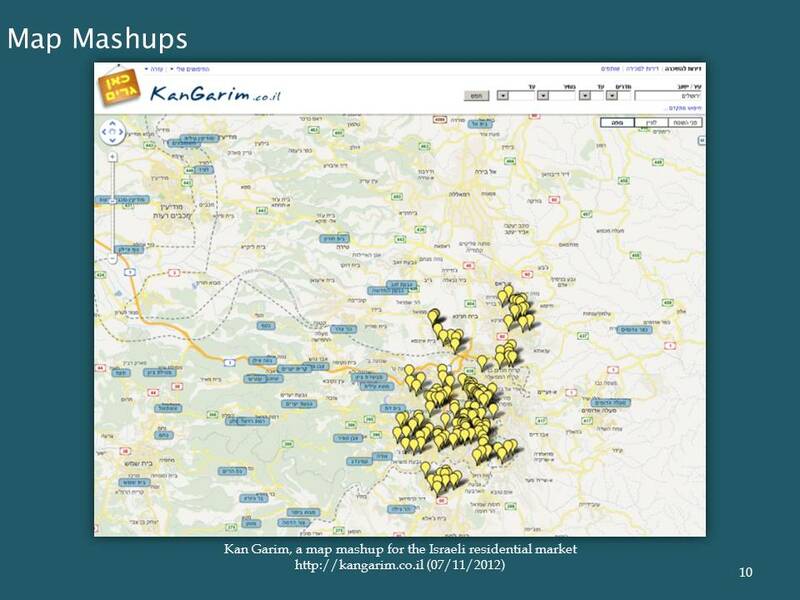 Kan Garim is a webpage for the Israeli housing market. The yellow placemarks on the Google basemap symbolize available tenements in Israel. The subset shows Jerusalem and its surroundings. One can recognize from the course of the green line (dashed in grey), that the website offers rental properties on both sides of the internationally recognized border. Needless to say, the website is only in Hebrew language and is not designed for Palestinian dwelling seekers. I argue that this map potentially lowers emotional thresholds for Israeli citizens to become settlers in the West Bank. By doing so, it is a highly political map, created off-side the classical realms of cartography. 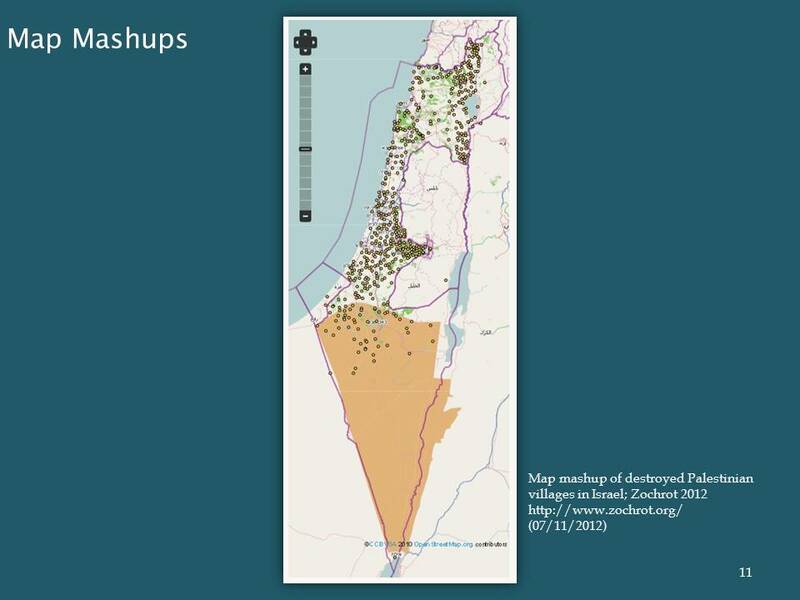 Here is a map mashup from the website of Zochrot, an Israeli activist organization which tries to raise attention for the Nakba in the Israeli public sphere. On a basemap from OpenStreetMap this map shows Arab villages that have been destroyed during or after the first Arab-Israeli war 1948/49. Thus, this map is a time-hybrid in a sense, displaying a current representation of Israel (the OSM-basemap) and confronting it radically with “the Palestinian others”, that the Israeli society has tried to swamp out for more than half a century. The destroyed and concealed proof that there never was a land without a people is suddenly back in the Israeli present. 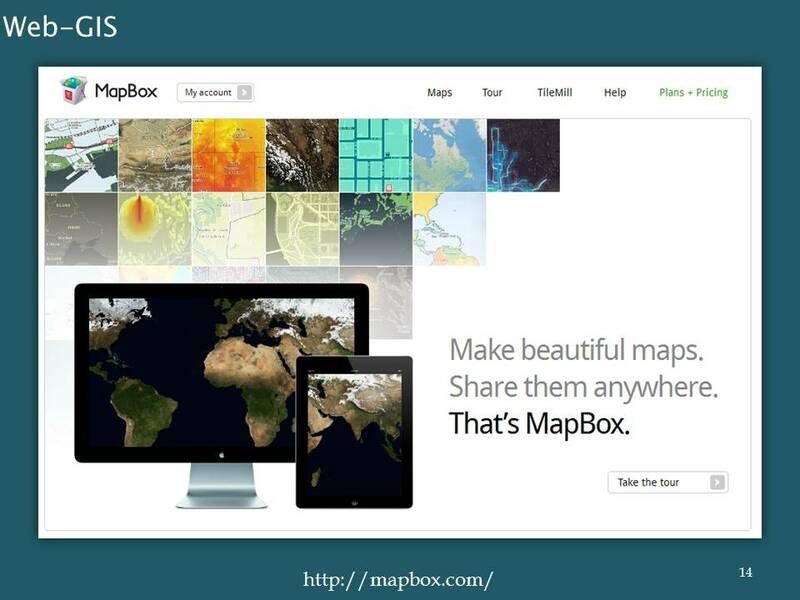 Another type of web 2.0-maps are collaborative basemaps. The basemaps which map mashups employ can be created or modified by “the crowd”. 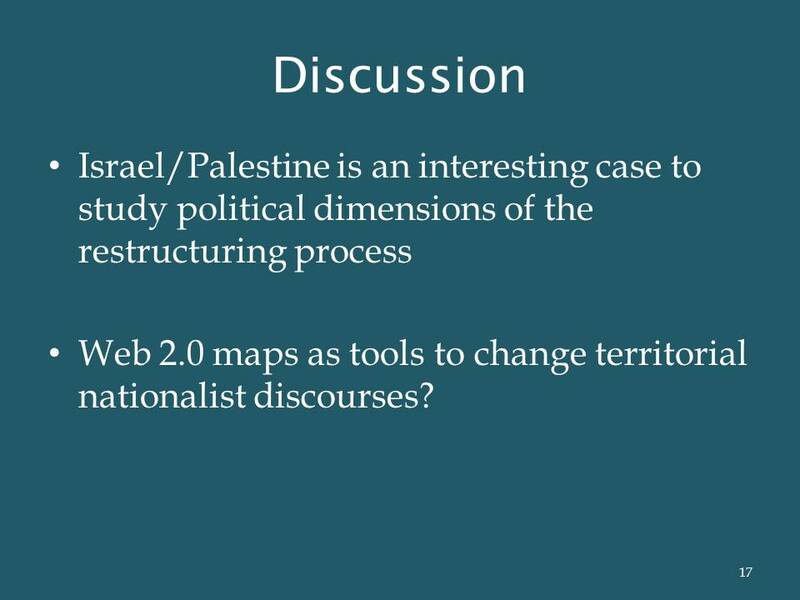 In this case they have to cope with the complexity and ambivalence of mapping Israel/Palestine in specific ways. The most famous and, certainly most important, example for such an editable basemap is the project OpenStreetMap. In the OSM standard layout Mapnik, nametags appear in the official language of a state. Accordingly, places in Israel are spelled in Hebrew letters, and in the Palestinian territories in Arabic. However, there are exceptions from this pattern. This slide shows, once more, a subset of Jerusalem and its surroundings. We can see that the old city of Jerusalem has, indeed, an English label. Jewish settlements in the West Bank are named in Hebrew, just as Arab villages in Israel. Thus, with regard to place-names, OSM seems to acknowledge Jewish settlements as part of Israel (in fact OSM is not a Zionist propaganda organization and the matter more complex, we could discuss this later if you like. But still, this is the map you get and it supports the Israeli narrative in the described sense). The concept of crowdsourcing can be applied to map mashups as well, resulting in, what is called, a crowdmap. The Palestine Crisis Map is such a crowdmap. It tries to portray events of human right violations in Israel/Palestine. The dots on the map represent such events, which are geo-located and associated with the categories on the right side. By zooming into the map, the big dots become disaggregated, until, on a local level, each dot represents only one event. Thus, the numbers in the big dots stand for the respective amount of aggregated events. The green button „submit a report“ in the upper right corner is an invitation to help feeding content to the map. Thus, by harvesting the crowd, the map tries to fulfill a journalist function: to tell what is happening on the ground and to visualize the spatiality of the conflict in a very specific way. This map was made by a guy called Steven Feldman, a user of the platform geocommons, which is one of the most popular web-GIS at the time. It is a thematical map of the Gaza war 2008/2009. 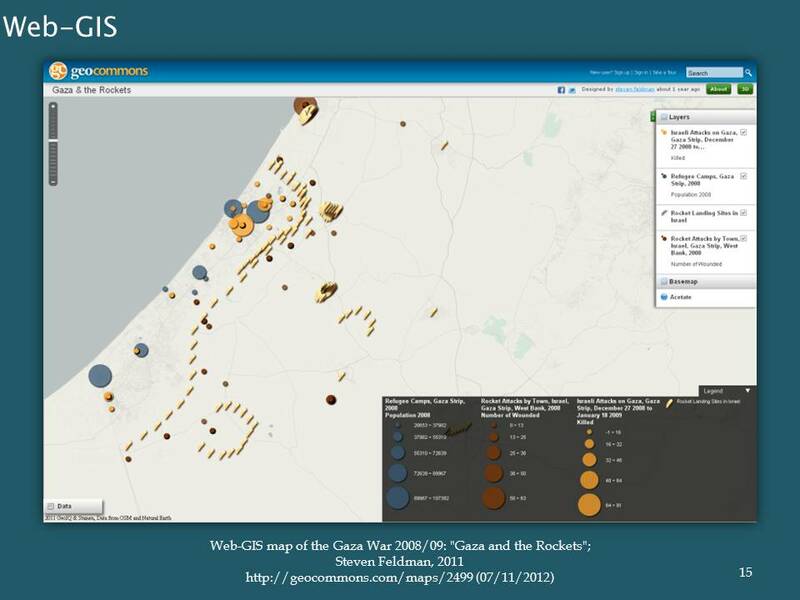 It combines data from several sources, showing Refugee Camps in the Gaza strip, rocket attacks on Israel and air strikes on the Gaza strip during the war. I guess, neither the Israeli government, nor the Hamas would have published such a map, since it shows not only the massive bombings of civilian areas by the Israeli Air Force, but also the military ineffectiveness of Palestinian rocket attacks. What can we deduce from the developments drafted above from a critical cartographic perspective? First of all, there can be no doubt that in the last years substantial developments have been taken place regarding patterns of map production. Web 2.0 cartography emerges at the intersection of the internet, digital cartography and a rising amount of geospatial data. The combination of these factors enable new cartographic techniques like map mashups, editable basemaps, crowdmaps and web-GIS platforms. New actors have entered the arena of cartography which has long been dominated by elites of academics, state agencies and big publishing houses. Enterprises like Google or Yahoo have discovered a new commercial interest in geospatial data and services, but there is also a diverse range of grassroot actors, political activists, web programmers and hackers generating maps. 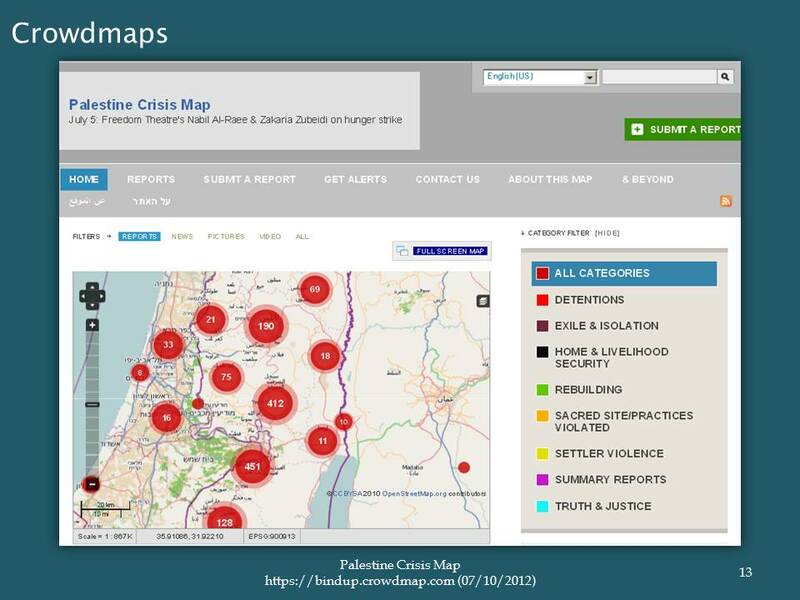 They all bring new impulses and ideas into the field, using the new techniques to produce new maps with regard to contents as well, like the residential market map or the Palestine Crisis map have shown. 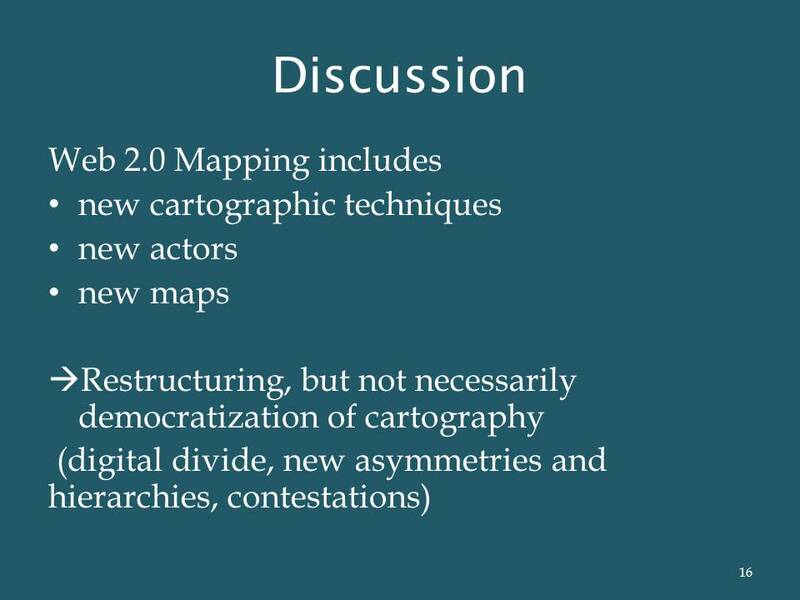 Similar to the debate about the web 2.0 in general the discussions around web 2.0-cartography often have a subtext of democratization and empowerment. The fact that more people can participate in the creation of maps and geo-referenced data, has been interpreted by some commentators as a democratization of cartography. Such euphoria is certainly unfounded and naïve, for at least two reasons: firstly, it completely ignores the digital divide. A broadband internet connection, a powerful computer and sufficient energy supply are still requirements that most people in the world lack, Palestine not being an exception. Not to speak of IT skills, language barriers or spare time to spend on creating maps. Secondly, collaborative mapping platforms are not free of power-relations, hierarchies, norms of behavior and sanction systems to enforce them. Rating mechanisms, as we know them from social networks, enable a stratification of users in categories of trustworthiness. Beginners are supervised by moderators. And there is always an inner sanctum of webmasters with a right of censorship and the possibility to expel users without a trial. We cannot speak of democratic communities here, and what we witness is not democratization but rather a restructuring of cartography. There are winners and losers. New voices might be articulated, but they surely produce new marginalized others. This diagnosis can be applied to Palestine/Israel as well as to any other region of the world. However, maps in this context have a special sensitivity, because they are so mired in conflictive territorial identities and are, thus, more contested than in most other cases. If we acknowledge this distinctiveness, the region might serve as an interesting case study. Mechanisms of inclusion and exclusion, struggles and conflicts within the current restructuring of cartography should take place more obviously and be easier to trace than elsewhere. We should be able find out who speaks to us through the maps and whose voices are silenced. I want to finish this paper with another point I’d like to debate. It is a slightly optimistic idea of how to employ the new mapping technologies for something good: maps in the Middle East Conflict traditionally served as tools of exclusion. From a pacifist, consensus seeking perspective they generally made things worse instead of better. Maybe new mapping technologies can turn the tide here. I’m thinking for example of maps, where features can be subject to debates, can be switched on and off, or are symbolized in blurred, fuzzy or transparent styles. Such maps might bring the possibility to map in conjunctives. I think it might be possible to use them to show the ambiguity of territorial borders, their subjectivity, contextuality and contingency. Thus, new maps could be used as educational tools to foster a long term de-escalation of the conflict. They could allow multiple narratives with equal legitimacy and change the discourses of strict territorial identities a little bit and strengthen out of the box thinking beyond a solution of two states with strict territorial integrity. In fact, the text is in Yiddish, spelled in Hebrew letters: Er hat shoyn fargesn | Un geyt in a nayem | goles! | Gedenk, Yid, yeder | Goles firt zum | Untergang (left side). Shoyn genug! | Ikh will a heym! 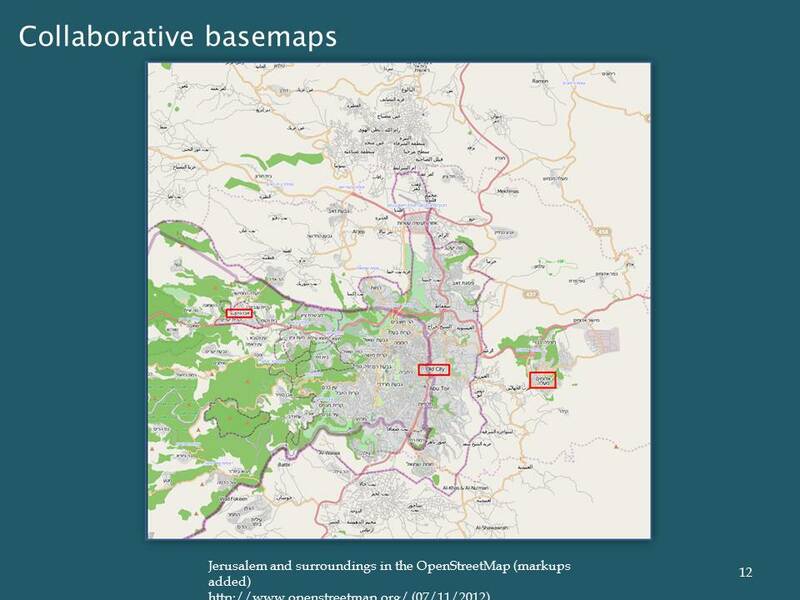 Dieser Beitrag wurde unter Uncategorized abgelegt und mit Cartography, Countermapping, Crowdmaps, Israel, Kartographie, Middle East Conflict, OpenStreetMap, Palästina, Palestine, Web 2.0 Mapping verschlagwortet. Setze ein Lesezeichen auf den Permalink. Zum Vergleich und fürs methodische Nachdenken ein Beitrag von Yaacov Lozowick.